Inflow into mutual funds (MFs) through systematic investment plans (SIPs) has hit another historic high in September. 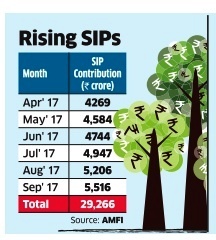 The sector collected Rs 5,516 crore during the month as the number of SIP accounts touched 1.66 crore (16.6 million), compared with 1.35 crore (13.5 million) at the beginning of this financial year. A year before, the sector got less than Rs. 3,700 crore. In a year, SIP monthly contribution has increased by about 50%. According to sector officials, every month Rs. 250-300 crore worth SIPs were added and this trend would continue. With this, the current financial year is likely to surpass Rs. 7,000 crore of consistent and steady investments on a monthly basis by March. This means a massive Rs. 84,000 crore of sticky inflows into MFs every year.